Let me ask you a question: What do you do with your old friends after you try so hard to be successful in life? Are your old friends at the same level you're at right now OR... have they made absolutely no effort to improve their lives? If it's the later, you have to a decision to make. Let me tell you something, If you are the smartest person in your circle of friends, that means you are the dumbest person in your group because you are not learning anything new. I am saying this especially to my fellow Haitians who grew up with a whole bunch of "condisciples" and 'Ti Zanmi' from around the way. You reach a level in your life and you feel that the people, and sometimes family members, from the old neighborhood are just dragging you down and making you feel like you owe them the world because you made it and they didn't. 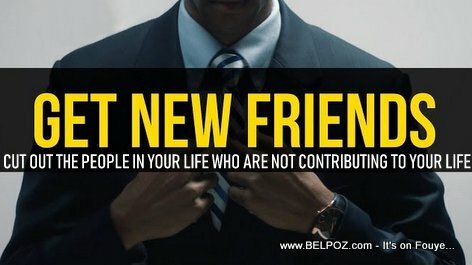 It is NOT mean to cut people out of your life who are not contributing to you life. If you want to rise at a higher level, you have to find higher caliber friends. It is not an easy thing to do but find yourself some new friends who are where you want to be, friends who are at the level you're at or higher. Keven Trudeau once said: "If you want to change some things in your life you have to change some things in your life." So if that's what you gotta do, change your friends. Que faites-vous avec vos anciens amis après que vous ayez essayé si fort de réussir dans la vie? Est-ce que vos anciens amis sont au même niveau que vous en ce moment OU ne font-ils aucun effort pour améliorer leur vie? Si c'est le dernier, vous devez prendre une décision.